The Blog of Funny Names is a huge fan of the Netherlands. It’s not just their many fantastic feats like inventing gin, being the tallest people in the world on average, or their many, shall we say, “do what you want” type legal practices. No, what we most like about the Netherlands around here are their fantastic names. We’ve covered many, and we will cover many more. Which brings us to today’s subject, Godfried van Voorst tot Voorst Jr. Full name Jan Joseph Godfried Baron van Voorst tot Voorst. Yep, that’s a mouthful. Imagine spelling that to the DMV’s infernal robot phone “assistance” provider. Just the voorst. The uncompromising look of a van Voorst tot Voorst man. 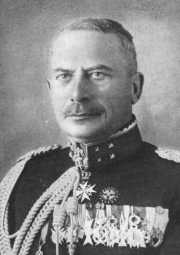 Mr. Van Voorst tot Voorst was a very notable Dutch military figure from the early 1900s all the way up to the second World War. Born just after Christmas in 1880 to Jan Joseph Godfried van Voorst tot Voorst Snr, who was the President of the Senate at the time (I imagine their roll call took a good while), and the lovely Anna Cremers, who may or may not have been the daughter of a great dairy family. Godfried Sr. also had a taste for wonderful names, marrying as his first wife the amazing Octavia Ottine van Nispen tot Pannerden. His second wife, whose name was also nice an long, was the daughter of the Dutch Prime Minister Charles Ruijs de Beerenbrouck, further cementing his awesome name credentials (as if that was at all necessary for the van Voorst to Voorst clan). van Voorst to Voorst Jr went on to a distinguished military career, publishing numerous books on military strategy and politics, becoming a very influential figure in the country between the wars, and becoming a boon to lazy journalists who could reach their required word counts just by writing his name two or three times. His influence is still seen today, at least in our eyes, in the continuing popularity of great names in the Netherlands. With Fedde, Cornelis, Gijs, Floor, and Guusje all in the top 100 most popular names given to Dutch boys and girls today, I think we can keep counting on this jewel of European naming to provide fodder for our blog for years to come. This entry was posted in Uncategorized and tagged dutch names, funny name, humor, humourous. Bookmark the permalink. Voorst tot Voorst, how on earth were you able to defeat your spell checker to post this? That is an amazing feat in and of itself, let alone all the fabulous names. Are the “J’s” pronounced as “I’s” or “Y’s” or some other alternative? Haha, I think Arto’s spellchecker has been beaten into submission when he spells the names of his Finnish friends, so he’s overpowered it! I think they’re Y’s, but Arto probably knows more than I do! The j’s are as y’s I believe. My spellchecker is on disability due to me writing for this blog, and can not contribute. Oh this post had me laughing!! Hey! This is serious business, no laughing here! Just kidding. Laughing, as a wise man hopefully once said, is good for the esophagus. I read this whole post in the voice of the Swedish Chef. And I don’t know if that’s near the Netherlands bc I’m American, and we’re stupid. How does one pronounce Gijs? Gotta gijs some more vowels, dude. All these tots and vans make me want to eat tater tots in a van. Down by the river. I mean the brook. The Beerenbrouck. Oh, beer and brook, a lovely combination! Haha, so many important questions and awesome points! Sweden is fairly close to the Netherlands, btw… just separated by a body of water and tiny Denmark. A long paddle, but a short flight. And I love the idea of drinking beer by a brook. That sounds like something Liz would recommend for me! I think it’s be kind of like “guys”, which is a great name to holler out in public, because everyone will turn around. Tots in a van by the brook with beer? I’m in! Now that’s a friday night. I love how much of a fan of Dutch names you are! Dutch names are so good that even people with funny names admire their funniness! And DUDE – I’m going to see you tonight for the first time in like 6 weeks! Woohoo! There should probably be some sort of Dutch Certainly Principle, by which account any Dutch name is 87% likely to be funnier than a corresponding name in any other country. 87% is about 7/8. That’s pretty good odds! Gotta be Mr. Rik Albert Blyleven. How can you not vote for a Hall-of-Famer? Wait, I just realized this guy is a Jr. That means there’s two van Voort tot Voorts!!!!!!!!!!!!!!!!!!!!!!!!!!!!!!!!!!!!!!!!!!!!!!!!!!!!!!!!!!!!!!!!!! !